Strictly individual project which is to promote knowledge and understanding among investors in terms of its appeal. More to say today will not, because in the video of the presentation of the basic meaning of this idea and it shows. Only through development of this project, to this product and added more ingredient - the appropriate unit composition in the form of alcohol base. So, to the already known original product cream bread, which is based on known components, added another ingredient - the alcohol. The ratio of the alcohol are different, depending on the percentage of capacity in this product this ingredient. That is, the strength of an alcoholic cream-bread may be different, and this will be confirmed by the corresponding indicators on the packaging. As a result of this innovative product, we have the emergence of a completely new alcoholic product that radically changes the use of alcohol-containing products. The simplicity and ease of use speaks for itself - not bottled, the possibility of using various forms of packaging, pleasant taste compatibility with different foods. For example, it is possible to easily eat with a spoon or cooking alcohol salad. Without exaggeration we can say that emerging new culture of foods containing alcohol, and thus appears a new industry of food alcoholic food industry. Naturally, the sale of alcoholic beverages is subject to licensing and the application of the excise tax. In our case, within the law, will also apply a similar approach in the sale of this alcoholic product. Below we recall the presentation of the first cream product cream bread, which was the development of the topic. The idea is that the bread turn into the original buttery mass and placed in individual packaging - glass, paper or "shrink wrap tube". When eating is difficult to apply to other products the cream-bread with the help of convenient packaging. Extended periods of storage, the possibility of making different flavors, including sweet, versatile storage and transport, easy warm-up, including in a microwave oven. Scientists from the Massachusetts Institute of Technology have developed a special RePaint system in which artificial intelligence reliably reproduces pictures using 3D printing, reports MIGnews with reference to the Daily Mail. Experts said that RePaint works by imposing ten translucent inks in thin layers. At the same time, their ideal sequence, which is necessary for obtaining a given color, is determined by the AI, the authors of the development emphasize. According to the researchers, the AI was able to learn not only to determine the colors needed for a particular area, but also to take into account changes in the lighting, which make it possible to obtain stable results. 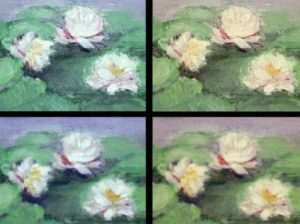 It is worth noting that before this, copies of paintings reproduced using photographs and color printing were noticeably different from the originals, since the colors on them were formed in the same plane. Scientists suggest that in the near future, RePaint may become an indispensable development. For example, museums could exhibit exact copies of valuable paintings, keeping their originals in a safe place.